I haven’t made a quilt in forever!! Time for baby quilt! A friend of mine is due this Friday, so checked my stash for fabric that would work with her lavender baby theme. I had everything already at home and didn’t have to make a run to the fabric store. I signed up for a Craftsy.com Free Motion Quilting class and this was the perfect opportunity to practice. 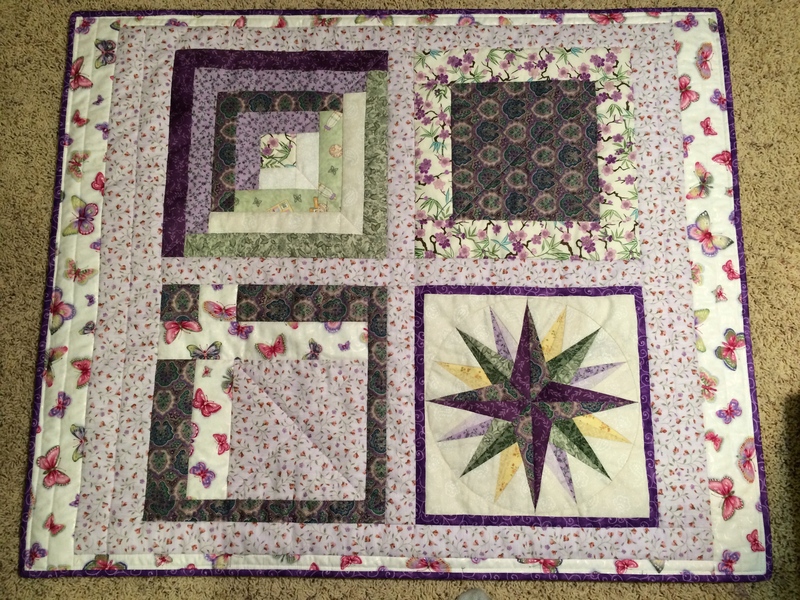 Thankfully, I stitched in the ditch for most of the quilting so all the uneven stitching was not as noticeable. All those imperfections make it more special right? I really like that cuddly rosette fabric that I used for the backing. The log cabin square and the mariner’s compass were languishing in my stash. At one time I was going to make a quilt for my bedroom which has not happened (not going to say never!). They were perfect for this quilt. I used foundation piecing method to make the mariner’s compass square. For another square, I made one was similar to this free topiary tiles quilt pattern. 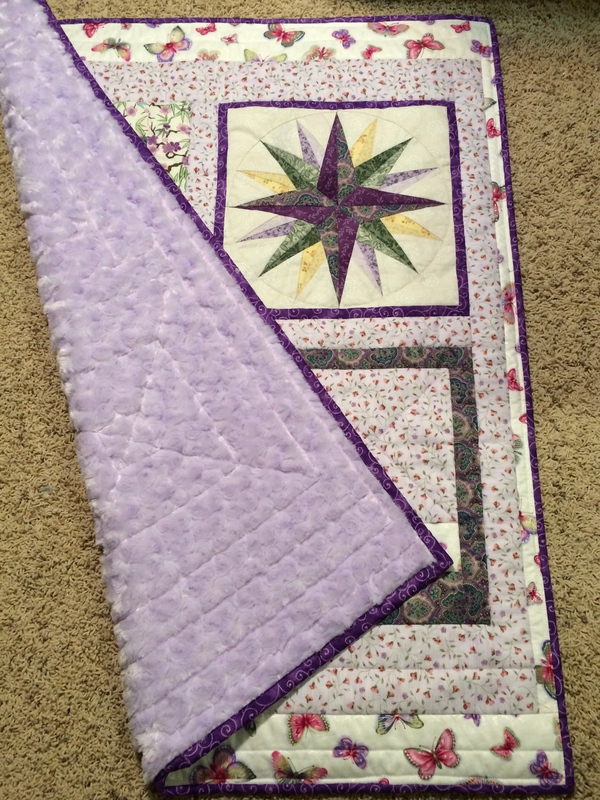 The quilt is made up of 12 inch squares with the borders added to make a quilt that was 30 x 36 inches. Instead of hand sewing the binding, I used this tutorial for machine binding. It made sense and it was pretty easy. I used a 1/4 inch allowance using 2.5 inch strip folded in half. This made the border stitching about a half an inch. Next time I will use a wider allowance for the binding so that it will be more even on front and back similar to the tutorial. This entry was posted in Completed Projects, Crafts, Sewing Projects, Uncategorized. Bookmark the permalink. Absolutely lovely. What a sweet gift this will be.